The KöR Teeth Whitening System is absolutely second to none. We make custom trays for you and give you gel to take home. You wear it every night while you sleep for two weeks. The results are incredible. 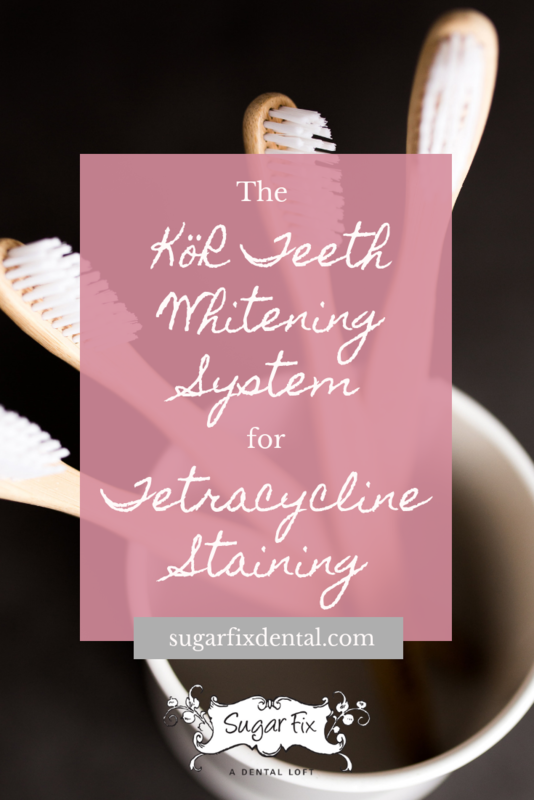 If you have a lot of staining or your teeth are really dark (especially due to Tetracycline), the KöR Teeth Whitening System is a perfect solution for you. The antibiotic called Tetracycline is used to treat a number of issues, though it isn’t used very often anymore due to the side effects… one of which is severe gray or brown staining of the teeth. In the middle of the 20th century, Tetracycline was often prescribed to children, which might mean you have some of this staining if you took this antibiotic when you were younger. Tetracycline staining developed on children’s permanent teeth while they were still underneath the gum line, so often, this side effect wasn’t apparent until way later. It was even possible for babies in utero to be affected if pregnant women took the medication! The dark stains caused by Tetracycline can cover the entire surface of the tooth, or they may show up as stripes. Tetracycline staining is actually embedded inside the tooth’s enamel (intrinsic stains) which makes it much more difficult to reverse. Fortunately, the KöR Teeth Whitening System can work wonders… we’ve seen it first hand! How Does the KöR Teeth Whitening System Work? As we said at the beginning of the post, the KöR Teeth Whitening System is an at-home professional teeth whitening system. It’s highly effective at both brightening teeth permanently and consistently… all while reducing sensitivity. First, we will make molds of your teeth so you can have your own unique, ultra-comfortable KöR whitening trays. The KöR Whitening Deep Bleaching System is completed with a final visit to Sugar Fix Dental Loft. Want to see some before and after photos from real Sugar Fix patients? You can click here or visit our Smile Gallery on Instagram! If you have any questions you can always contact us at (773) 883-1818 and talk with one of our whitening specialists, or just go ahead and schedule your free consultation by clicking the button below!